Here in Melbourne, Roman Blinds are a popular choice as a window furnishing option, but few know where this timeless Roman Blind design originated. Approximately 2000 years ago, during the construction of the famous Colosseum in Rome, the Roman Blind concept came about. Dust from the horse-drawn carriages and building remnants were constantly entering through the windows of homes and shops, causing extreme nuisance. To solve this problem, the Romans began hanging damp cloths across their windows. Not only did this block the debris, it also protected homes from the intensity of the Mediterranean sun. From this inception point, Roman Blinds continued to evolve, and today in Melbourne, they hold their status as both a practical and stylish choice. With the exciting technological developments in Automated Home Systems, Roman Blinds can now be motorised to open and close with the touch of a button. This feature, offered by some of the leading blind specialists throughout Melbourne, is highly sought after in modern offices and new luxury home and apartment buildings. The lifespan of blinds has remarkably increased thanks to the possibility of higher quality Roman Blind materials available. Now, Melbourne blind specialists can produce Roman Blinds which will not fade and wear out against high UV exposure or prolonged heat conditions. This means, installing Roman blinds is a cost effective, smart choice. When it comes to window furnishings, many home and business owners like to match their new blinds with existing decor. With so many fabric choices, from polka dots to bold graphics, classic tones to bright colours, Roman Blinds are versatile enough to enhance any space. With design appeal and ingenuity at the top of the list in Australian blind manufacturing, some professional blind companies have the ability to create stunning seamless pleat effects on Roman Blind orders. This is achieved by using backing rails rather than pin prick holes along the folds. 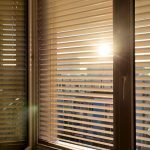 Regardless of whether the blind is drawn or opened entirely, this advancement in blind technology makes these blinds attractive in any position. It is often the case in today’s fast paced world, that people rely on trends, so having been trending for around 2000 years, Roman Blinds hold solid credibility as a good choice in window furnishings. To find the ‘perfect Roman-Blind match’ for your Melbourne home or office, contact Tip Top Blinds. With over 40 years of industry experience, no other company is better equipped to provide high quality, professionally installed blinds.